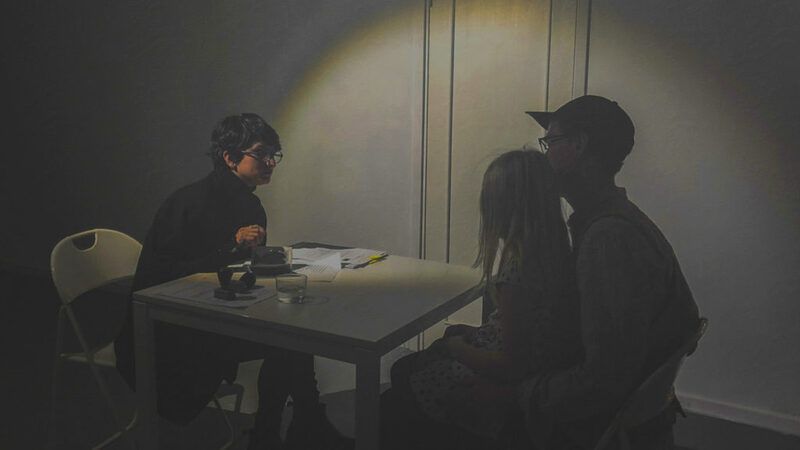 Better safe and sorry is a new collaborative work by Malmö-based artist Bahareh Mirhadi and Tehran-based artist Arash Mirhadi, constructed and performed as part of the Weekly Mass exhibition at Skånes konstförening. The two siblings are this year’s recipients of the Unicorn Artists in Solidarity residency grant. Their projected work was centered around collaboration, family memories, control and the differences that distance constructs. When Arash Mirhadi’s visa application and subsequent appeal were rejected, distance became enforced onto them as a method. Furthermore, the power and control that institutions exert became the starting point of their installation and performance. Control and institutionalised distrust breaks relationships and reaffirms, again and again, the pyramid of power. Schengen/EU use profiling as a tool to hinder mobility and access when requested by residents of countries framed as “a risk” in migration law terms. What is more important, freedom or security? is one of the key questions asked by the artists in the ellusive room of the installation. It is also one of the key questions framing their talk. Moderated by the two curators of Weekly Mass, Simona Dumitriu and Tawanda Appiah, the talk will address Bahareh and Arash’s most recent work in the wider logic of their solo and collaborative practices. Bahareh Mirhadi was born on April 20, 1985 in Shiraz, Iran. She is currently living in Malmö, Sweden. She received her Bachelor in Painting in Iran, then she continued her education at the Umeå Art Academy in Sweden and graduated with a Master of Fine Arts in 2012. In Iran, she worked with figurative painting and drawing, concerning herself and events happening in her life. Since moving to Sweden, her painting revolves around her surroundings and society. Nowadays working mostly with film and performance, she explores themes such as migration, human action and reaction, patience and tolerance, and ways people are enforced/controlled – and ways people control themselves – in society. Arash Mirhadi was born on February 6, 1980, in Shiraz, Iran. He received his Bachelor degree in handcraft from Isfahan University of Art in 2004. He moved to Tehran in 2008 and afterward gained his Master degree in Painting from the Faculty of Art and Architecture of the Islamic Azad University of Tehran center. He works primarily in painting and graphic design but is also active in photography, illustration, and printmaking. The second talk of Better safe and sorry with take place in Göteborg, at Konstepidemin, on November 28 2018, 5 pm. Skånes konstförening is one of the 20 art associations in Sweden to take part in Sveriges Konstföreningars’ nation-wide project “Konsten att mötas”, a project which offers to the art associations the possibility to meet and exhibit artists born outside Sweden or recently arrived in Sweden. ”Konsten att mötas” is carried out in collaboration with KRO/KLYS and their ongoing project ”Konsten att delta: bild och form” and with Sensus study association. The project is financed by PostkodStiftelsen. This talk is organized by Skånes konstförening and Moderna Museet Malmö, as part of the “Konsten att mötas” project, and hosted by Moderna Museet. Skånes konstförening’s public program and exhibitions are presented with support from Region Skåne, Malmö Stad, Swedish Arts Council and ABF.